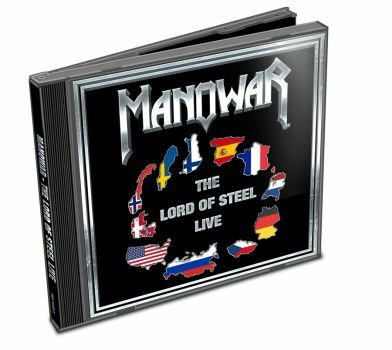 MANOWAR - THE LORD OF STEEL LIVE (CD) | Online Shop | Wizard LTD. Album: "THE LORD OF STEEL LIVE (CD)"
MANOWAR will release highlights of their Lord Of Steel World Tour 2012/2013 on a live EP, featuring performances from the Czech Republic, Finland, Germany, Italy, Russia and Sweden. "From the first show in Zaragoza/Spain to the last show in Yekaterinburg/Russia, The Lord Of Steel World Tour was a terrific experience," said Joey DeMaio. "Performing new songs for the first time in front of your audience is the ultimate test of the power of the songs to connect to the only people that matter. Our fans were totally brutalized and went wild as you will hear on this new EP," he continued. "'The Lord Of Steel Live' is a thank you to our amazing fans; it will forever immortalize this tour and those who attended it." The album will be mixed and mastered at MANOWAR's own studios Hell and Haus Wahnfried by Joey DeMaio personally with long time MANOWAR engineer Dirk Kloiber.